Welcome back! Okay, I thought last week’s meal prep was the last I was going to cook in my kitchen before moving, but I was wrong. 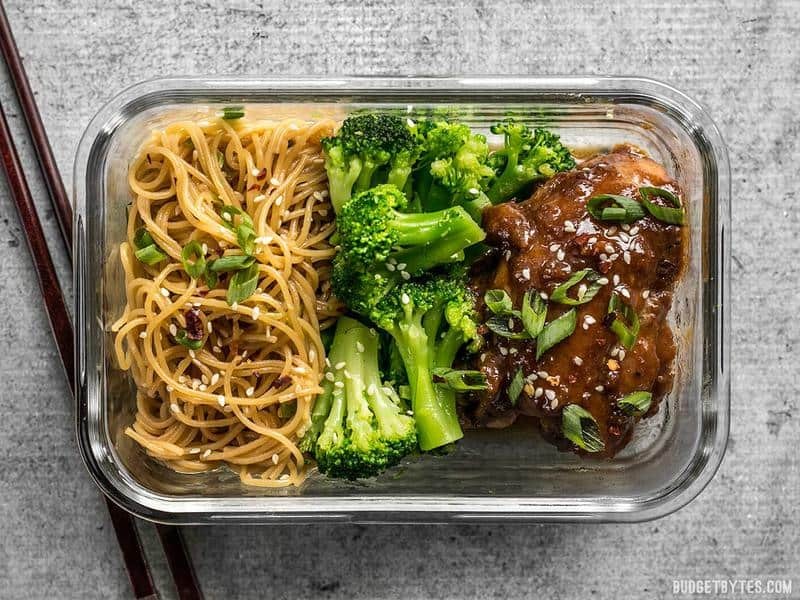 Mid-week I decided to use up the last four chicken thighs in my freezer to make these Sticky Ginger Soy Glazed Chicken Meal Prep boxes to get us through the rest of the week before packing up and shipping out. 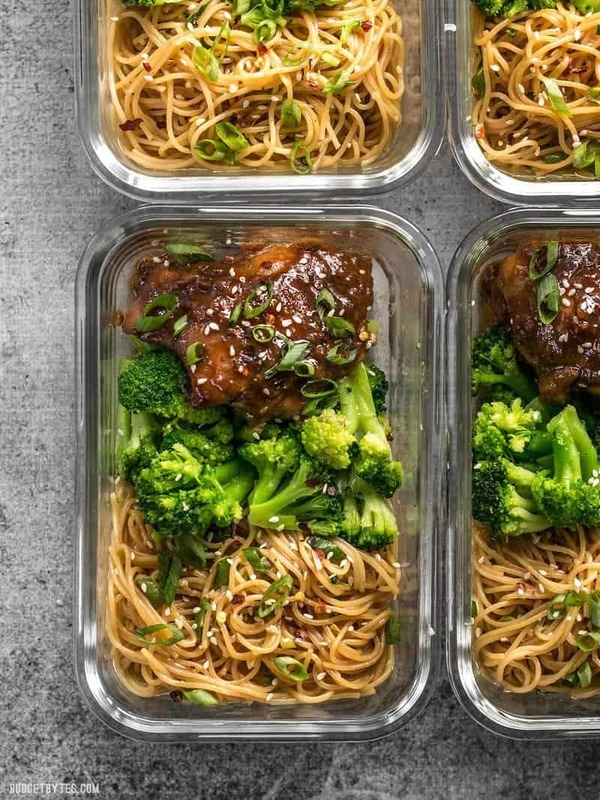 This week’s meal prep is super simple, but also my favorite type of meal prep. I love doing an easy base of rice or noodles, frozen broccoli florets for my greens, and some sort of protein. 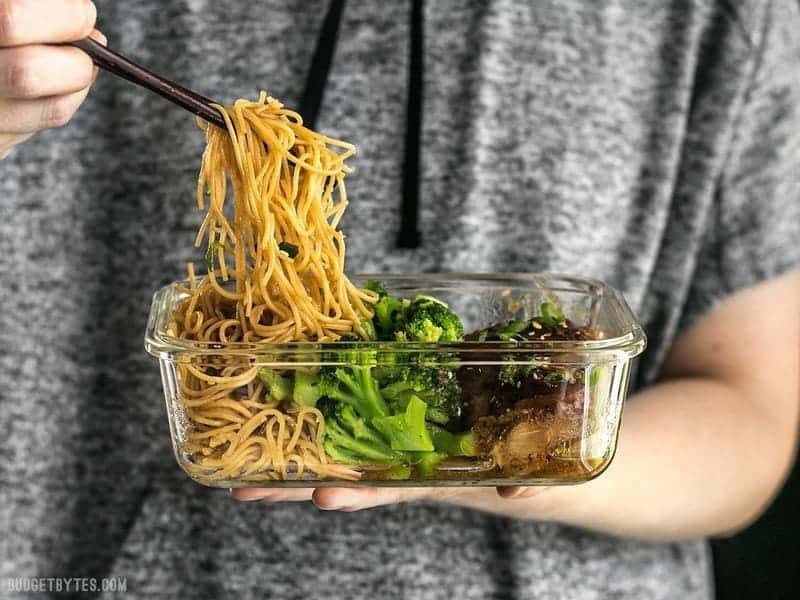 It’s such an easy and delicious formula and you can do so many variations on the rice or noodles and protein, that I never get tired of it. 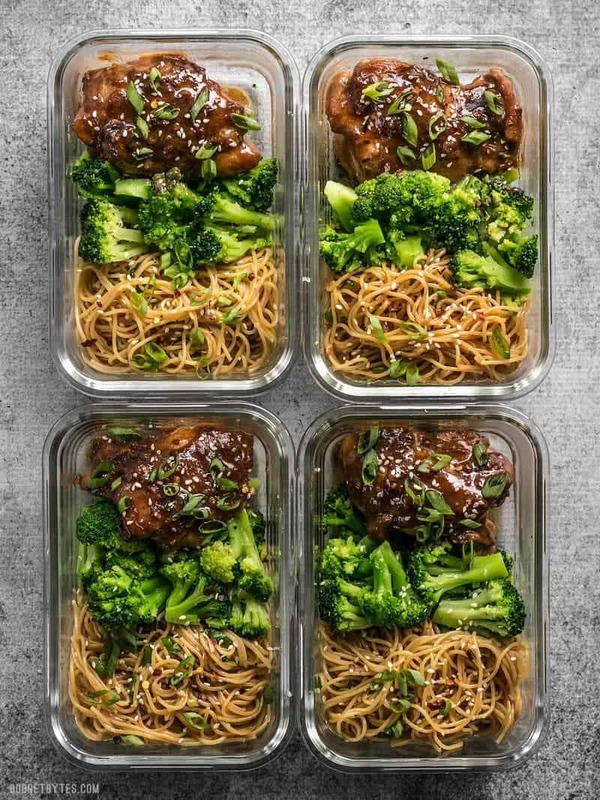 I love using frozen broccoli florets in meal prep boxes because they hold up well, and because they require no chopping or cooking (they’re already blanched), so they’re super convenient. No Leftovers this time, yay! I added a pinch of red pepper to each box just because I wanted a little heat, but that’s totally optional. Make sure to read the label on frozen broccoli closely! There are several types of frozen broccoli and while the terminology can depend on the brand, they’re usually along the lines of florets, cuts, or stems and pieces. Make sure to get the bag labeled “florets” or you may end up with a lot of stems. While stems are great for casseroles, soups, and recipes where the broccoli will be puréed, they’re not quite as appetizing just for eating plain. This box reheats in the microwave without any special considerations (but it’s always a good idea to stir often while reheating). You also shouldn’t have any issues with extra juices or things getting soggy or limp this week. That’s why I love this type of box! If you want to use fresh broccoli, I suggest steaming the florets until they just begin to turn tender and are bright green before adding them to the box. That will soften them just enough so that they will cook at an even rate with everything else when you reheat your meal. For frozen florets, you don’t need to even thaw them before adding them to the box (unless you’re going to eat one portion the same day). The florets will thaw in the fridge overnight. Hi! Thank you for the recipe, I tried a little of both tonight and they were super tasty! I just cooked these, and will be eating them all week starting tomorrow. My question is how long do you need microwave them to cook the broccoli? And will I need to add any water to steam the broccoli? Can these meals be frozen? Looks delicious!! This one will probably just freeze so-so. Since the sauces aren’t super liquidy, they may dry out a touch when frozen.